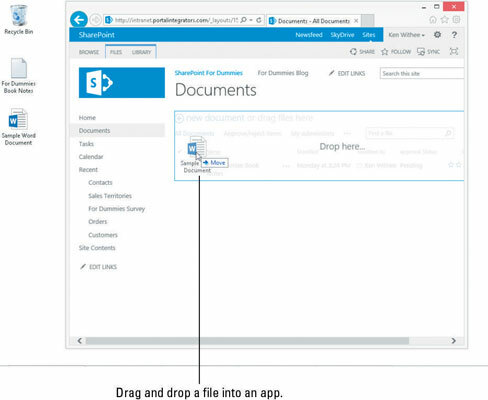 When you have a single document to upload to an app in SharePoint, you can do so easily through the browser. The easiest way is to simply drag the file onto the app and drop it. Drag and drop doesn’t work with all browsers. When you have the app open, you should see the text + New Document or Drag Files Here. If your browser doesn’t have the ability to drag and drop files, you see only the + New Document link. In addition to dragging and dropping files into an app, you can also click the Upload Document button on the Files tab or click the + New Document link at the top of the app. You can also send documents to an app via e-mail. If your SharePoint farm administrator has configured SharePoint 2013 to accept incoming e-mail, individual apps can be given their own e-mail address. When someone sends a document as an attachment to that e-mail address, it’s uploaded to the app. This approach works well when you need to allow people outside your organization to place documents in an app.